We’ve got your weekend: Concerts, films, drives, social change, we could keep going! 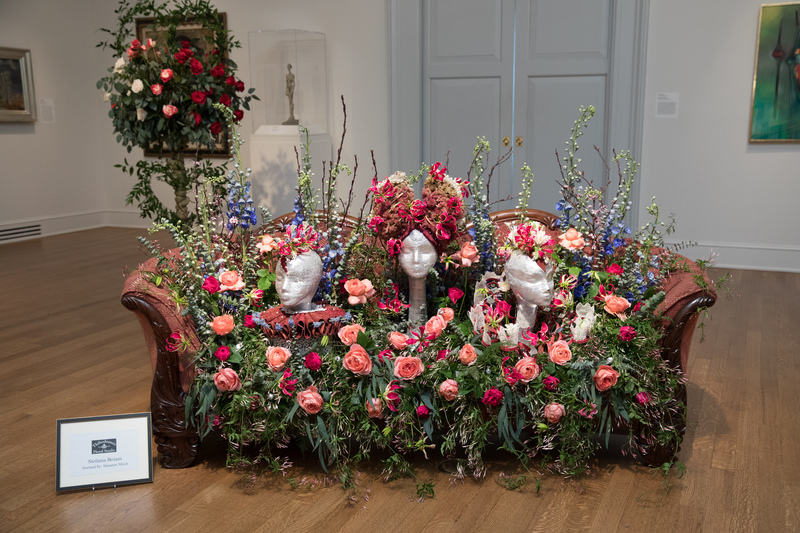 Art in Bloom 2018. (Photo provided by: New Orleans Museum of Art). Art in Bloom 2019 open Wednesday, March 27. Wednesday, March 27/Lafayette Square: Young Leadership Council (YLC) has announced the lineup for its annual YLC Wednesday at the Square concerts. This Wednesday, the square will be filled with the sounds of Flow Tribe with Robin Barnes and hopefully your voice singing along. The YLC Wednesday at the Square concert series is free and open to the public. Proceeds from food and drink sales benefit YLC’s community service projects, which are designed to improve the quality of life in New Orleans and to foster leadership skills in young professionals. The concert begins at 5:00 PM, and you can find a full list of the upcoming concerts here. Wednesday, March 27/Marigny Opera House (725 St Ferdinand): It’s time to get panicked…by how much you are going to entertained and educated on Wednesday. Shotgun Cinema is once again participating in Science on Screen, and they begin their 2019 series with Elia Kazan’s Oscar-winning (and New Orleans-shot) Panic in the Streets. The screening will be followed by an introduction to epidemiology and a Q&A with Dr. Lina Moses, Clinical Associate Professor in the School of Public Health and Tropical Medicine at Tulane University. This screening is free and open to the public, with the doors opening at 6:30 PM and the film starting at 7:00 PM. For more on the screening, you can check out their write-up here. Wednesday, March 27-Sunday, March 31/New Orleans Museum of Art (1 Collins Diboll Circle): Spring is here. Flowers are in bloom, and so is the art of this city. With a focus on light, transformation and discovery, the theme of Art in Bloom 2019 at the New Orleans Museum of Art (NOMA) is Illuminations: Looking Within and Beyond. This springtime event takes place March 27-31. Floral arrangements on view in Illuminations will echo NOMA’s special exhibition Keith Sonnier: Until Today. The first comprehensive museum survey for conceptual artist Keith Sonnier, Until Today presents the artist’s illustrious works in neon, as well as rarely exhibited works in sound, satin, radio waves, and bamboo that demonstrate Sonnier’s interest in the way architecture, light and form commingle to shape human experience, communication and interconnection. The preview includes many events you can check out on their event page. Thursday, March 29/Three Keys (600 Carondelet Street): Saints and sinners are going to be live at the Ace on Thursday. What are we talking about? Well, hard hitting Drag from the New Orleans Drag Workshop and Storytelling curated by Greetings from Queer Mountain is what we’re talking about. This event will be a who’s who of New Orleans Queer Artists featuring power blouses Franky, Dede Onassis, TitiBaby, Nathan Lane Bryant, The Darling, Amanda Golob, Genevieve Rheams, and Flannery Meehan and a very special guest appearance from the legendary gay icon Judy Grahn. They’ve promised not to keep their opinions to themselves on this night, expect politics, tears and inspiration. This event will kick off the Saints and Sinners queer literary festival. Come at 7:00 PM for a very pre-show poetry slam with Judy Grahn and the exceptional southern charms of poet Greg Brownderville. Drag and Storytelling to follow. There is a $10 cover ($5 students) and free admission for Tennessee Williams VIP pass holders. For more information on the event, you can check out their event page here. Friday, March 29/Lavin-Bernick Center for University Life (Tulane University): American filmmaker Ken Burns is visiting Tulane University on Friday, March 29 from 3:30 to 4:30 PM to talk about film making, documentaries, and whatever else comes on the table. Tulane professor of history Walter Isaacson will moderate a dialogue with Burns, which will include clips of Burns’ works and a discussion of the people and events that molded America’s history. A Q&A session will follow the discussion. The event, which is free and open to the public, will take place in the Kendall Cram Room on the second floor of the Lavin-Bernick Center for University Life, which is located on Tulane’s uptown campus. Friday, March 29/Contemporary Arts Center (900 Camp Street): New Orleans musician Aurora Nealand is teaming up with theatre company Goat in the Road Productions (GRP) to create a concert based on Ms. Nealand’s self released album, KindHumanKind, to be presented by Contemporary Arts Center New Orleans. The live performance will present a visual world that links story telling and music. The performance will feature Ms. Nealand, as well as New Orleans musicians Free Feral, Tiffany Lamson (The Givers), and Alexis Marceaux (Sweet Crude). The performance will take place on March 29 – 30 at 7:30 PM and March 31 at 3:00 PM. Tickets, which you can purchase here, will run you $20.00. For more information, you can check out the event on CAC’s website. Saturday, March 30/Studio Be (2941 Royal Street): Dancing Ground’s “Dance for Social Change” has been happening since March 18, and this weekend they will be presenting “Reunion.” This is their new multidisciplinary performance piece at Brandon “B-Mike” Odums’ ephemeral warehouse. Each performance will be followed by small group discussions amongst audience members about what we can do as a community to address gentrification. This performance and discussion will take place at 12:00 PM on Saturday and 3:00 PM on Sunday, March 31. Tickets are on a sliding scale ($5-40), and the event is free for anyone under the age of 18. For more information, you can check out their event page here. Saturday, March 30/Port Orleans Brewing Company (4124 Tchoupitoulas): One Book One New Orleans is hosting their annual Books for Brews event! As always, all books collected will go toward their community partner organization, Louisiana Books 2 Prisoners. This year, Louisiana Books 2 Prisoners has asked them to help provide writing material to inmates across the southeast, so they will be collecting composition notebooks (the kind without the spiral) and mini legal pads. Bring your donations and exchange them for beer! Donors will receive one beer ticket per composition notebook or one beer ticket per three mini legal pads. A single donor will receive a maximum of three beer tickets. The donating begins at 1:00 PM and goes until 4:00 PM. For more information, you can check out their event page here.